After more than a week, we finally got to the beach and flew some kites. We had missed some wonderful days because the landscapers also decided the days were wonderful and came to clean up the yard. Yes, we paid someone to clean up the yard and set it to rights. There was years of neglect and my husband and I would have been working all summer and probably both have ended up in jail for attempted murder if we had tried to do it ourselves. So we stayed at home and supervised the work and now have a respectable yard in a neighborhood of respectable yards. Must keep up the status quo. So, where was I? Yes, the beach and a kite flying day. I awoke to sound of rain on the sky lights and thunder over the ocean. Not a good start. We were rained out on Mother’s Day. Not two Sundays in a row. Now we can go flying any day we wish but Sundays are the weekly club fly when we meet with friends and enjoy the skies together. Missing a Sunday means we won’t get to see some friends for another week. That can lead to more talking and less flying when we do meet. But I digress. A check of the weather shows that there will be a two-hour window of sunshine just about the time the club is supposed to fly. So we load up the car and off we go. Low and behold, we are not the only ones. There is an out-of-town friend and our intrepid leader from the kite shop there to fly. Now things are looking up. There has been no rain for at least two hours. It is still cloudy but the winds are as predicted and the clouds are starting to move away. At last a chance to fly those new kites that have just been sitting at home for the past couple of weeks. First up is my new Twin Tail dragon by Into The Wind. This was a Mother’s Day present. 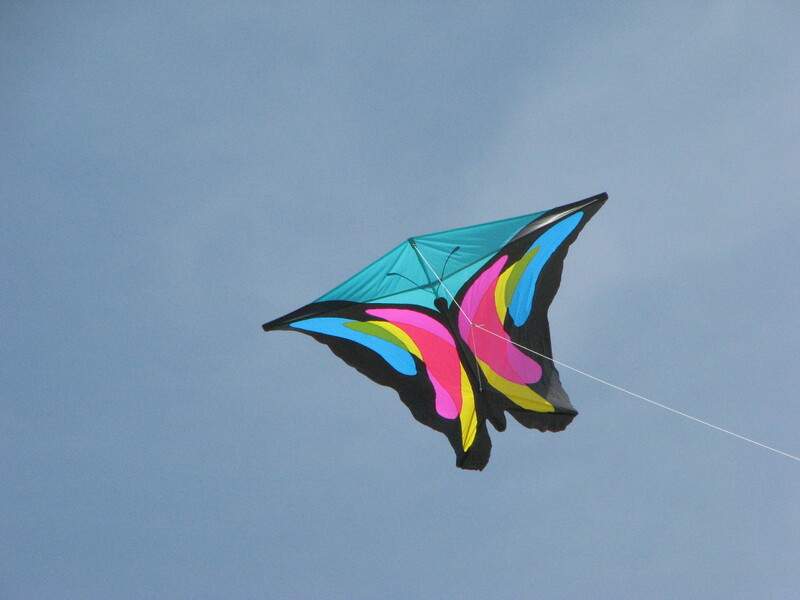 I had admired this kite when we put it up in the Civic Center for the Home and Garden show this past March. The winds were about ten to twelve miles per hour. 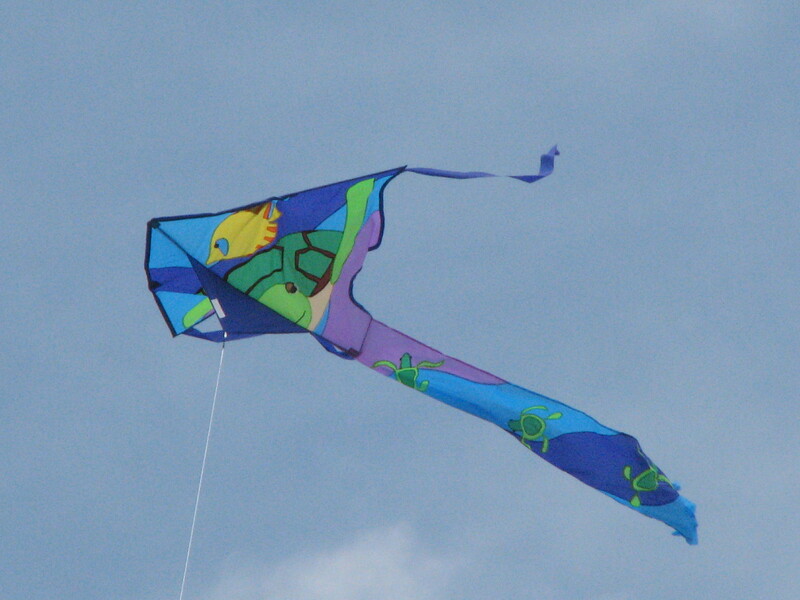 Perfect for just about any kite. The dragon went up without hesitation and looked great. Next up was my Joel Scholz Butterfly. This one was a vintage kite with wooden dowels and a tubing connector. Construction methods that were long ago replaced with carbon and fiberglass rods and plastic connectors. It was made by Premier just after Joel Scholz gave them the rights to make it. When quality still mattered and kites were made in America, not China. It was a guaranteed flyer. And fly it did. Just popped right up and hung in the sky. My third kite was one that the kite shop owner put up. It was a trial for a small parafoil that he is thinking of carrying at the shop. I fell in love with it. It is only about 2.5 sq. ft. Small enough that I wouldn’t try to make something like it myself. Yet it was so cute and flew so well I just had to have it. So this one went from the beach to my bag. No stop in the store. Because of the rain earlier, I decided not to bring any stunt kites with me. Instead I spent time visiting with other fliers. Especially with our resident KAP flier. It is real interesting watching him take aerial photos and talking about KAP. For those who haven’t read my earlier post, KAP stand for Kite Aerial Photography. It is fascinating. Part of me wants to try it and part of me knows I’ve got to many irons in the fire already. Meanwhile my husband is visiting and helping others and has put up two kites of his own. Yes, we have his and hers kites. They reflect our divergent interests in kiting. 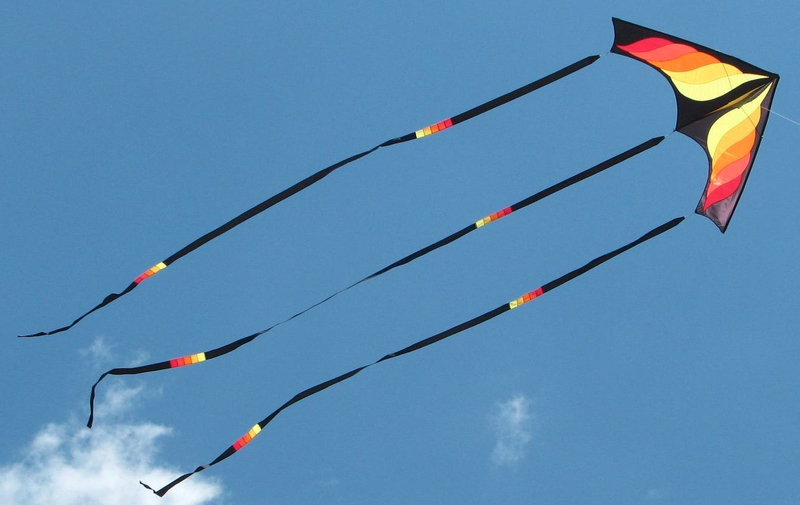 For instance, I collect and fly dual line stunt kites and am dabbling with quad lines. My husband does not fly stunt kites although he has a couple and keeps telling me he wants to try. He had flown the Symphony 2.2 by HQ a couple of times. Today he flew a couple of easy single line kites. One was the Prism Stowaway Delta and the other was a Turtle Easyflier by Premier. He is a collector of turtles and has just about every kite that has a turtle on it. And he flies most of them. The first time we saw the Stowaway delta fly we nicknamed it the “kamikaze kite”. It was jumping all around in the sky. This day it went up and hung in the sky like a delta should. In fact, I liked it so much, I have one on order. Of course, the Easyflier is named so bacause it is easy to fly. 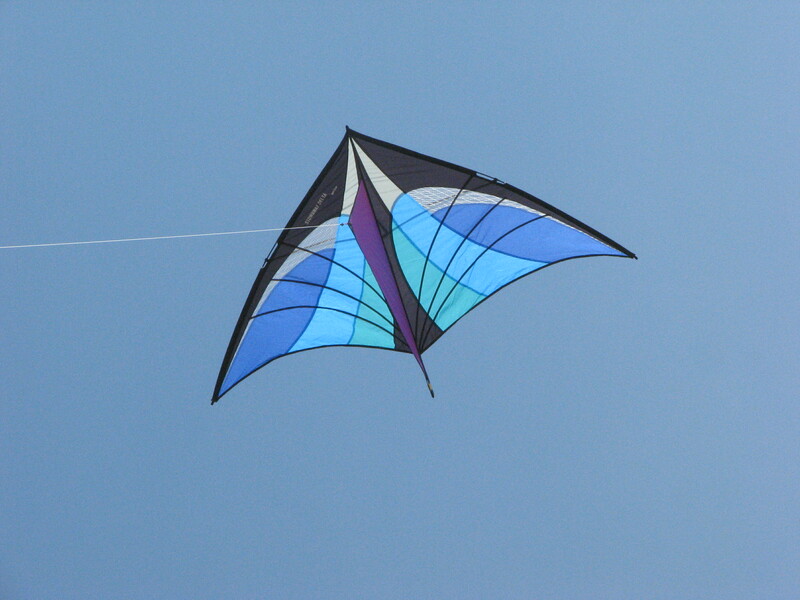 It is a delta-type kite with a broad tail incorporated in the design. 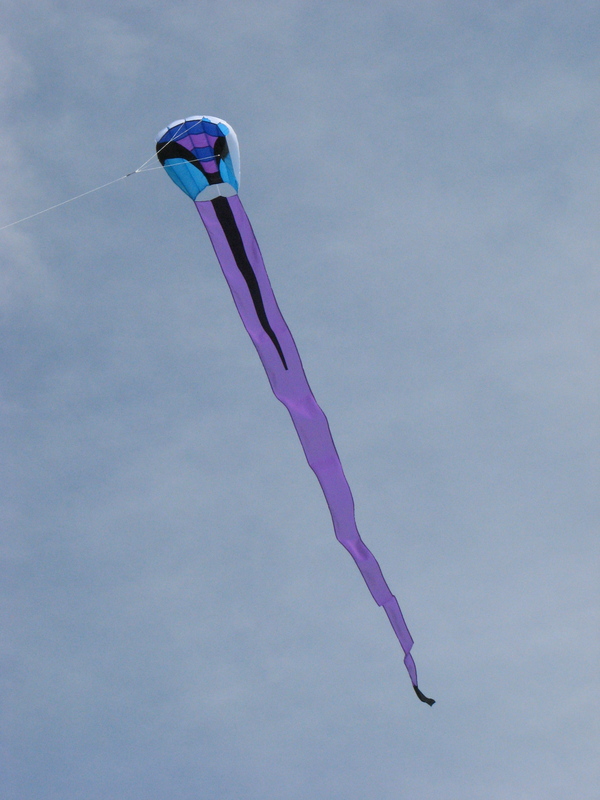 It is a fun kite. 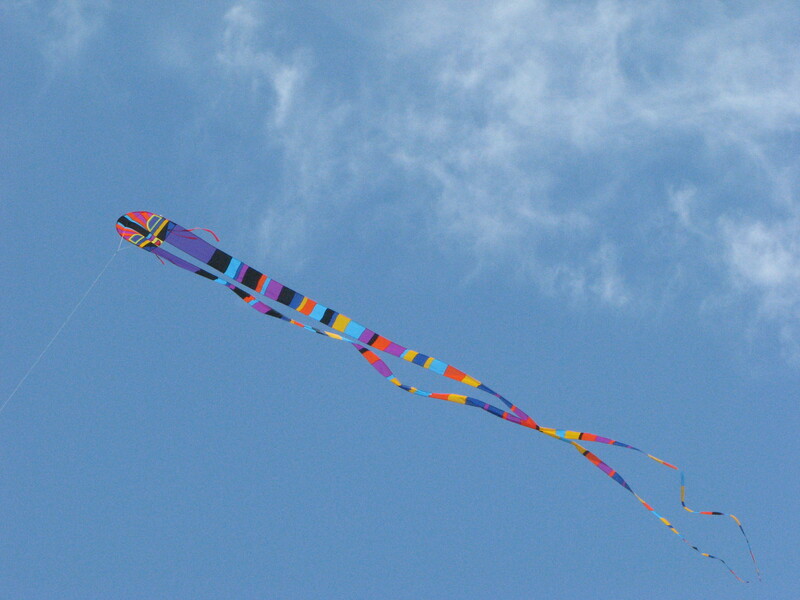 A kite for kids. Maybe that’s why my husband likes it. I keep saying he had never really grew up.